A successful character rig lies in the preparation. Making a successful character rig depends on careful preparation. MPC lead rigging technical director, Stephanie Wagner, shares the three steps she takes before beginning a character rig. 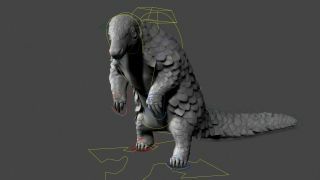 One of her many projects was overseeing the rigging on the pangolin puppet rig made for The Jungle Book, one of the many 3D movies MPC has worked on. Whenever I pick up a new character, I start gathering a lot of references such as slow-motion videos, skeleton images, and learn about the species history and specifics on Wikipedia/YouTube. I have been looking at birds recently; I’m trying to gather a lot of knowledge about their anatomy and how it defines their motion, for example the role of the wishbone and how the pectoral muscles are involved in the lifting of the wings. I like to be informed when I start working on a character so I can rig it with confidence and also assist other departments like animation if questions come up. I start by placing skeleton geometry inside the model followed by a joint layout, skin cluster and a first puppet build. For the puppet, I choose the modules (legs, spine, arms, etc.) needed for the character and add features (e.g. a space switch) based on animation feedback. The core of any rig is still based on joints and a skin cluster. The joint layout is essential to the production of a movie from start to finish. Being confident in placing joints and painting skin weights is a core skill of every rigger in the team, along with scripting, maths, modelling and an interest in anatomy. After the initial puppet building and animation/rigging feedback phase, I start working on the caching rig which will later be used on screen. When I am working on a hero character I tend to add a muscle rig as well as correctives and several skin simulations to highlight the most important aspects and anatomical features of the character. It’s still my favourite part of rigging to see a character progress in rigging and come to life in shots. MPC’s rigging department is a candy store of rigging tools artists can choose from. We pretty much have every commonly used Maya tool on steroids and a lot more! This article was originally published in 3D World. Buy issue 239 or subscribe here.